In recent years, crime rates have been rising in a number of key countries in Latin America and the Caribbean (LAC). At the same time, governments have had to limit spending on security because of the pressure to follow fiscal austerity programmes. There is therefore a temptation to link the two and conclude that crime is going up because spending on preventing crime is going down. But a recent report and analysts’ comments suggest it is not that simple: how the money is spent may be as important as the total amount that gets spent. An Inter-American Development Bank (IDB) report on overall government spending, ‘Better Spending for Better Lives – How Latin America and the Caribbean Can do More with Less’, published in September, has an interesting chapter on how governments spend money on security. The first point it makes is that resource availability doesn’t seem to be the key problem. In fact, over the sweep of the last decade, spending on security has actually increased but “results do not match this greater fiscal effort”. The report says that there are traditionally two approaches to the problem of crime. One is the ‘iron fist’ (also known as ‘mano dura’) – harsher, more militarised policing, longer sentences, and an increase in the prison population. The other favours a more preventive focus, tackling what are seen as the underlying causes of crime, including urban poverty, unemployment, high school dropout rates, and family disintegration. Politicians of the Right often favour the punitive iron fist, while those of the Left prefer the preventive approach: neither have been terribly successful. Some defend a ‘third way’ known as ‘smart on crime’ – using empirical evidence to deliver a mix of both punitive and preventive measures. The IDB report says this ‘smart’ approach could deliver much improved results without a need to spend more. The IDB highlights the sheer magnitude of LAC’s crime problem. The region has 9% of the world’s population but 33% of the world’s homicides. The LAC annual homicide rate in 2015 was 24 per 100,000 inhabitants, four times higher than the world average. Of the 50 most violent cities in the world, 43 are in LAC. One in every five Latin Americans has been a victim of robbery in the last year, and six out of ten robberies involved violence. 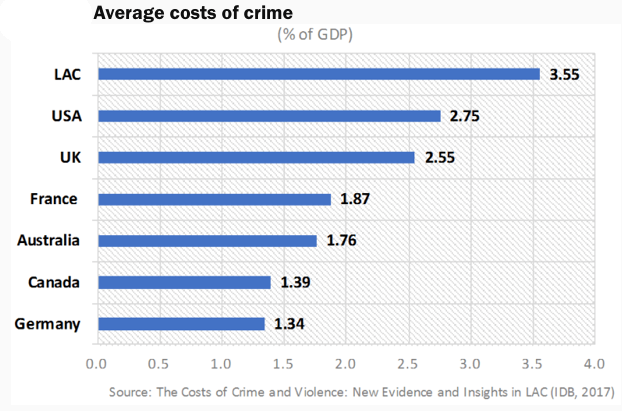 The overall cost of crime is calculated at 3.5% of GDP. Regional governments already spend a lot of money to try to solve the crime problem. On average, spending on security takes 5.4% of government budgets in the region, close to double the 3.3% that is required in the more developed OECD countries. Expressed as a share of GDP the LAC security spend is 1.6%, just above the OECD total of 1.5% (however, on a per capita basis, the OECD spends more than LAC). Of particular interest is the conclusion that the region spends most on policing (63.4%, equivalent to US$74bn), followed by criminal justice (22.3% or US$26bn), and then prisons (8.7% or US$10bn). Compared with the OECD this is roughly the same on policing, more on criminal justice, and less on prisons. It is hard, from the existing data, to determine causation: whether greater spending leads to lower crime, or whether higher crime leads to increased spending. That said, the report does point to an in-depth study of the 26 Brazilian states which suggests that, if certain assumptions are made, a 1% increase in security spending could lead to 0.4% fewer homicides. Nevertheless, it still argues that before spending more, “it is important to analyse how authorities can improve efficiency and effectiveness by spending better”. One way of doing this is to increase the efficiency of the biggest area of spending – the police. Efficiency can be calculated by comparing outputs – such as percentages of crimes resolved – with inputs such as the total number of police officers and vehicles. Using an efficiency index the report finds that LAC police are 70% as efficient as the rest of the world; therefore bringing their efficiency up to “frontier levels” could improve crime prevention by 30% at no extra cost. Adjusting the efficiency index to take account of other background factors such as government effectiveness and the rule of law changes the numbers somewhat, but still points to an important potential for improvement. The report notes that there are major variations of efficiency within countries. For the system as a whole “the more centralised decision-making and the more formal and organisational rules that exist, the greater the efficiency”. There are always choices over how to spend any extra money available for law enforcement. However, the report points out that there is an academic consensus on three major principles that should be applied to maximise efficiency. These are first, to prioritise preventive rather than reactive and punitive activities; second to seek targeted, rather than dispersed spending; and third, to choose activities based on scientific evidence of impact – preferably cost-benefit – rather than intuition. There is a lot of evidence showing preventive spending is currently very low, but has the potential to grow and deliver big efficiency improvements. One case study showed that intensive tutoring of at-risk adolescents in Chicago led to a 44% fall in arrests for violent crime and a cost-benefit return of eight dollars for every dollar spent. Meanwhile the share of preventive spending in El Salvador in 2011 was as low as 3%. Targeting is also particularly valuable since crime appears to be disproportionately concentrated around a small number of high-risk places, people, and behaviours. Research shows that about 50% of crime is concentrated in 5% of street segments in the US and Europe. Research in Montevideo showed that 2% of the school population was responsible for 70% of violent incidents. There are also strong links between crime and certain behaviours – such as alcohol abuse or gang membership. One response to this is to develop hot spot policing (HSP) where, rather than being dispersed and reactive, efforts are made to concentrate preventive police patrolling around those places and times when most crime occurs. Evidence suggests HSP is highly effective, but an IDB survey of 15 countries in the region showed that only three had developed HSP. Despite this evidence of the value of targeting, the IDB’s research also suggests that less than half existing programmes are currently targeted. Although a lot of valuable scientific evidence has been gathered world-wide to inform policing decisions, much of it is simply not used in the region. The report analysed 283 existing programmes in six countries and found that only 22 of them included content or intervention techniques in their design, substantiated by empirical evidence of efficacy or cost effectiveness. Beyond the police, there is room to improve the quality of spending on criminal justice and prisons. LAC’s criminal justice system is notoriously ineffective. Impunity is high, with an average of three out of four murders going unpunished. Justice is slow. No less than 41% of imprisoned Latin Americans have not yet been sentenced. Reducing this proportion would improve the quality of justice and reduce prison overcrowding, itself a big driver of crime. The report highlights a striking dilemma for those working on security in the region. There is a very strong case for adopting a mixed range of detailed reforms that have been shown to improve the efficiency and effectiveness of law enforcement, but public opinion is, at the end of the day, more interested in the iron fist. The IDB puts it as follows: “The pain and fear caused by violence means that the loudest voices in the public space generally speak of repression rather than prevention, revenge rather than justice, punishment rather than remedial penalties.” Surveys have shown that between 2012 and 2014 the number of Latin Americans who favour punitive measures increased from 47% to 55%. A special tax on crime? A lot of ‘smart policing’ initiatives are based on using large quantities of crime data to pinpoint hotspots and anticipate trends. An emerging development in Latin America is the use of mobile apps to provide the same service, not specifically for the police, but for local residents and tourists with hand-held devices. Many apps have already launched, others are on the way. Cory Sisskind, who in partnership with Nick Gómez is launching an app called Base Operations for Mexico City, São Paulo, Rio de Janeiro, Santiago, Montevideo, and Buenos Aires, says, “So much brain power goes into solving problems like getting people the exact Amazon product they need. Why can’t we use those same technologies to solve larger social problems, like chronic violence and insecurity?” Base Operations seeks to combine police reports and crowd sourced data to build constantly updated “crime heat maps” so its users can know which are the safer areas of these cities and which should be avoided. There is already an app on offer in Rio called Fogo Cruzado (‘Cross fire’) where users report gunfights in real time. In El Salvador the recently-launched Smart912 has been described as the next ‘Waze for crime’ also based on the idea of sharing security alerts. In Buenos Aires province in Argentina Seguridad Provincia was launched last year: it allows citizens to report crimes online, circumventing the risk of dealing with potentially corrupt police officers. On its launch governor María Eugenia Vidal said, “From now on, the police inspector does not have total control over crime reports any more.” The Mexican government launched Viva Segura, allowing victims to report incidents of sexual violence. The idea is that local prosecutors will follow up the reports and the data will help police.